If Baby Zion grows up to be a heartbreaker in the near future, we all pretty much know where to pin the blame. Richard Gutierrez is clearly passing on his dapper dressing skills to his son. Here’s another Richard who rightfully deserves a spot in our list of stylish dads, and he’s tall, dark and handsome—yup, you guessed it! Now don’t tell us Richard Gomez wasn’t one of your favorite leading men from the '90s because we totally wouldn’t believe you. Doug Kramer may already be a dad of three, but this baller still knows how to score some style points even outside the basketball court. Who else do you think makes #GavIncredible wear those super cool Jordans? Anyone who was born in the '80s to mid-90s can attest to Patrick Garcia’s natural talent for making teenage girls swoon. We are totally loving the white tux he wore to his wedding to Nikka Martinez. Other than the fact that he surprised his wife with a fairytale wedding that had all the other ladies green with envy, we also love how Zoren Legaspi always manages to look so put-together. This dad’s not one to shy away from bright colors and bold fashion choices. There’s a reason why Piolo Pascual is dubbed the ultimate heartthrob, and if it isn’t quite obvious yet, this guy is the total package. This dashing dad can pull off a tuxedo one minute and then rock a pair of ripped jeans the next. Would you even believe us if we tell you that his son Inigo is already 17? No kidding. Even when he’s not showing off his rock solid abs while riding waves, Luke Landrigan still looks pretty rad in his board shorts and white shirt. This surf instructor slash Cosmo hunk even throws in a fedora hat and a pair of sunnies to complete his beach #OOTD. Eric Dee Jr. is the alpha male of the local go-to eyewear hub Sunnies Studios, the OOTD partner and husband of "It" girl Bea Soriano, and the daddy of little Braeden. 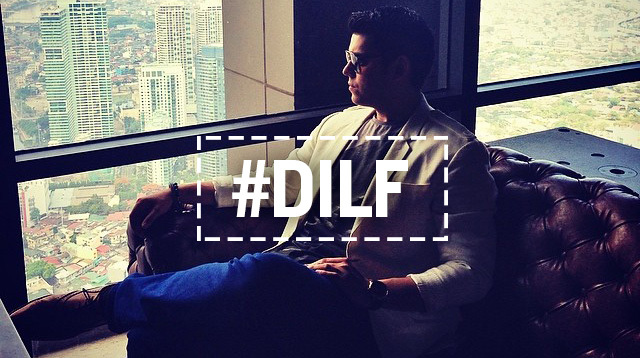 Also an expectant father, GMA’s primetime king Dingdong Dantes knows how to suit up. But even in his casual leather jacket and ripped jeans combo, Marian Rivera’s hubby never fails to look sharp.